While my husband has been gone, I’ve been working on cleaning out the freezer of left-overs but sometimes I crave something freshly baked. I had bought some bananas which were nice and firm at the store but when I got home I discovered their firmness was due to their being frozen. They were not good candidates for breakfast cereal topping and so I decided I would make a batch of banana muffins. I had a half consumed package of dried plums–prunes!- and some Black Walnuts from my farm. I thought I had flour but discovered in the middle of mixing that the only flour I had was corn flour and about a half cup of wheat. I tossed in the remainder of a box of oatmeal; slopped that gloopy mess into a muffin tin and baked them. 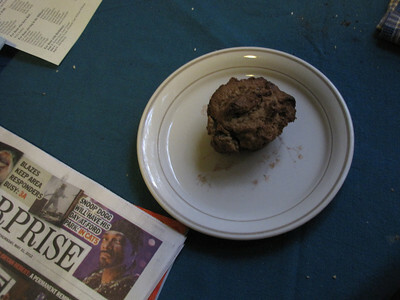 They smelled good; tasted good but had a very soft texture–and of course due to lack of wheat flour were quite crumbly. Still they make an excellent breakfast coupled with yogurt.